The Original Hand Roll Bar. Gift card can only be used in person at the restaurant. Unfortunately, gift cards cannot be used in conjunction with Postmate or Chow Now orders due to the constraints of their payment system. 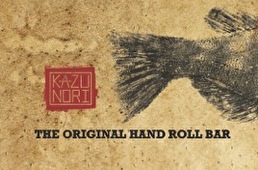 Gift card can only be used in KazuNori locations only. For balance inquiries call the phone number to a KazuNori's location below.